A distinctive, mature, full-flavoured red cheese with a hint of sweetness and a crumbly texture. The secret's in the taste! Keep refrigerated at 2-5°C. 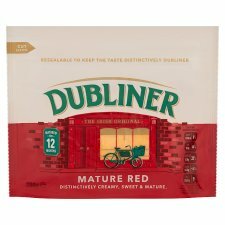 To enjoy Dubliner Cheese at its best, remove from fridge 30 minutes prior to eating. Enjoy within 7 days of opening.